New research looking at the future profile of young people entering higher education (HE) from London shows that the numbers of younger student entering HE will increase by over 50% by 2030, nearly 75% of these students will be from BAME backgrounds, over 50,000 will be the first in the family to enter HE and the numbers entering HE eligible for free school meals may approach 100% from some parts of the capital. The research produced by AccessHE, the network for social mobility through higher education in London, uses data on demographic changes and higher education participation to forecast who will enter HE from London by 2030. For some ethic groups, in particular those from other/mixed and African backgrounds, an increase in numbers entering HE of over 10,000 is predicted. London has for some time sent more young people eligible for free school meals to HE than any other part of the country but this gap is set to widen if present trends continue with in every inner London local authority over 60% entering HE by 2030. 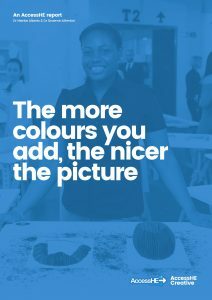 ‘This report shows that London is driving diversity in higher education participation in England. This diversity is a strength to be celebrated but will require HE providers to adapt and change what they do over the coming years’. The report was launched at the AccessHE Annual Conference 2018 with BT: Social Mobility and Higher Education in London, on the 20 September 2018. The introduction of the English Baccalaureate (EBacc) in 2010, together with the 2015 decision to make EBacc subjects compulsory in secondary schools and ongoing funding pressures, has led to the prioritisation of Science Technology Engineering and Mathematics (STEM) subjects at the expense of others – particularly the Creative Arts. Right now, young people in schools across the country are finding themselves unable to study arts subjects at GCSE and instead must fuel their passion outside of the classroom and often at great expense – placing those from low income backgrounds at a disadvantage. If these young people are not being encouraged to study the arts at GCSE and/or cannot fund their passions, this will have (and is having) a knock-on effect in sixth forms and colleges: without having studied creative arts subjects at A Level or equivalent, students are struggling to demonstrate and evidence the right skills for studying these at higher education level. Moreover, there is a danger that those students applying for such courses are only those from certain backgrounds where there is a long-standing tradition and/or parental funding to support. Without a pipeline of suitable, trained talent, you can begin to appreciate the huge impact this change will have on the creative industries in London. 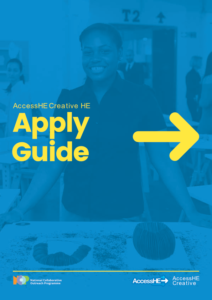 Launched in July 2018 as part of AccessHE Week 2018, the AccessHE Creative HE Apply Guide offers information and support for learners interested in applying to creative HE courses who are otherwise discouraged from pursuing their passions for the Creative Arts. You can download an electronic copy below. If you would like a physical copy, please contact Vanessa.Baptista@londonhigher.ac.uk. The Government is committed to widening access to higher education (HE) for students who have left care. However, for unaccompanied children claiming asylum in the UK (over 3,000 in 2015) who fall under the care of local authorities, there is very little research on their progression rates to HE nor about the challenges they face. Launched at an AccessHE event on Monday 8 May, this report draws on the views and experiences of unaccompanied asylum seeking children (UASC) in HE, local authorities, third sector organisations, the Office for Fair Access (OFFA) and higher education institutions. The report identifies barriers to UASC progressing to HE and offers a number of recommendations for different stakeholder groups. This report examines the challenges of widening access to creative arts and design higher education courses in London. It forms part of the early work of the AccessHE Creative Network, which aims to bring together stakeholders from across the HE and creative sectors to find collaborative solutions to address the challenges laid out in the report. The report was launched at an event on 30 November at which Marcus Davey. Chief Executive and Artistic Director of the Roundhouse, Jacqueline Rose, Acting Head of Culture at the GLA and Steven Kavuma, Founder of Diverse School and Executive Director of S+K Project, gave keynote addresses. As part of the AccessHE Students at the Heart of Social Mobility Conference, held in July 2016, our Student Advisory Group created a manifesto outlining how those in higher education can best work to help aid student success. The manifesto was developed by the group following a survey distributed to students at AccessHE member higher education institutions, which captured current students’ feelings about information advice and guidance related to HE. The survey had over 120 people responses and helped shape discussions on IAG at Student Advisory Group meetings. The manifesto is a list of recommendations, written by students themselves, and was presented at the Conference. The AccessHE Winter 2013 Conference ‘Social Mobility in London: The State of the City’, the first in a series of three conferences on social mobility in London, saw over 100 delegates come together on the 18 November 2013 at the LCA Business School. The event was chaired by Sadiq Khan, then MP for Tooting and Shadow Lord Chancellor and Shadow Secretary of State for Justice with a keynote address from Baroness Tyler of Enfield, Vice Chair of the All Party Parliamentary Group on Social Mobility. The attached report ‘Social Mobility in London: The Role of Higher Education’ by Dr Graeme Atherton (Head, AccessHE) was launched at the conference.